This trip into Nashville by the Los Angeles Kings – like the one last month – will be different for me. Bob Miller, who greatly helped me break into the National Hockey League many years ago, won’t be at Bridgestone Arena tonight. Just before the Predators hosted the 2016 NHL All-Star Game, Bob underwent a physical. It turned out to be far from routine, as he learned that he needed quadruple bypass surgery. That has kept him away from the Kings broadcasts ever since. The good news: the surgery was successful, and he will be able to return to the broadcasts. The bad news (for me) the recuperation period is indefinite, and he won’t be here for the final regular-season meeting of the Predators and Kings. No one could have been as lucky as I was to learn how to do the job at an NHL level from another product of college hockey – Bob Miller. It was the fall of 1978. I was moving from Buffalo to Southern California. Bob had joined the Kings five years earlier from Madison, Wisconsin. He knew what a transition it would be. Bob is a very gifted announcer. That’s been the foundation of his career. He’s always on top of the play. After more than 40 years, he continues to have the love of the game, the enthusiasm for the work the job requires, the clarity and the great humor to continue at a high level. The humor? 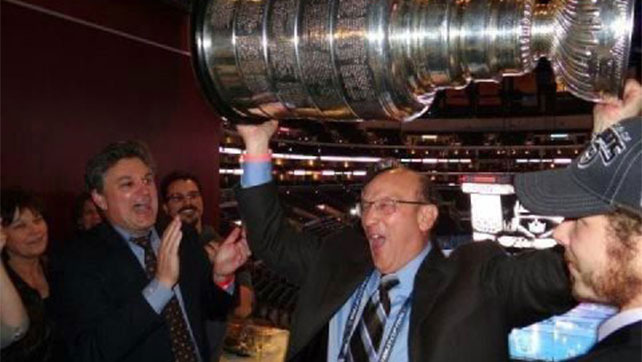 Nobody can tell a story like Bob Miller. I can’t think of anyone who can make me laugh harder than he can. He won the Foster Hewitt Award in November of 2000 for broadcast excellence from the Hockey Hall of Fame. Even though I left Los Angeles (initially for Seattle) in 1981, Bob always “kept me included.” He somehow found me in a hotel room in Des Moines, Iowa, in August of 1988 to tell me the Kings were getting Wayne Gretzky! There were so many frustrating seasons for the Kings from their inception, several seasons where they didn’t make the playoffs. You could understand how that frustration turned to elation when the Kings qualified for the Cup Final for the first time in 1993. That series with Montreal ended with the Canadiens taking the Cup, following the infamous stick-measurement that went against Marty McSorley. Instead of going home to Los Angeles with a 2-0 series lead, it was tied, and the Canadiens took the series in five games. The Kings then failed to make the playoffs for the next five seasons, but in 2012 they went on an amazing run. Seeded eighth in the West, they knocked off the first (Vancouver), second (St. Louis) and third seeds (Phoenix) in a total of just 14 games to make the Cup Final. An improbable dream was about to become reality for the Kings and Bob. They beat New Jersey in six games, and were able to hoist Lord Stanley’s Cup. Kings Captain Dustin Brown brought the prize to Bob in a suite at Staples Center. The emotion is clear to see on his face. That celebration was a long time in the making. The Kings lost the Western Conference Final the following season, but won their second Cup in 2014. If you were to see how the fans react to Bob (and his broadcast partner since 1990, ex-Kings RW Jim Fox) around Staples Center, you would understand the high place he holds in their hearts. 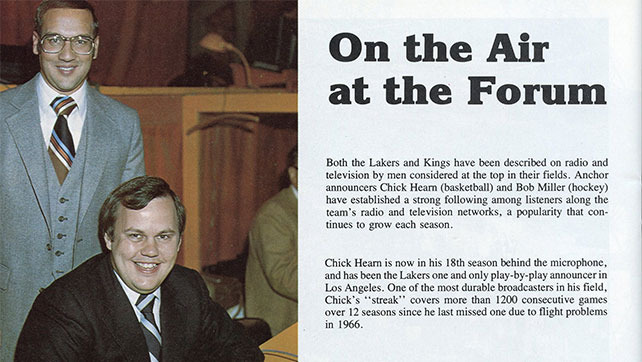 He has been as important to them as Vin Scully has been to the Dodgers and as the late Chick Hearn was to the Lakers. In a 1998 ceremony celebrating Bob’s 25 seasons with the Kings, Scully and Hearn were on the ice with him. I am proud to have been his on-air partner for three seasons and lucky to count him among my friends. He will be missed tonight! Get well soon, my friend.